In Sandwich Making State - Click & Drag Ingredients to Prep Area. R - Reset the game. Midterm project for Intermediate Game Development -- Make an Autobiographical Game. 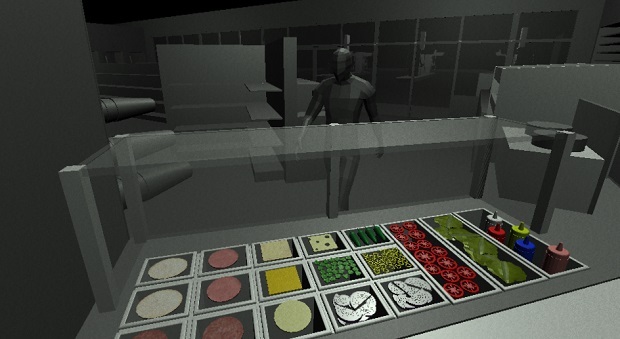 This is a game about working night shift at a gas station and making food for customers. The solitude and fact that it was night shift was important to me so I tried to make that evident in lighting and mood of the game. Customers will enter the store and you need to make them sandwiches while maintaining their satisfaction. If their satisfaction is too low, you will be fired. The largest problem I faced in this project was with graphics and rendering and the limitations of WebGL. I spent a while tweaking lighting and different rendering settings only to find that WebGL did not support many of the options I was implementing so I had to work around that by cutting a lot. As far as successes, I am fairly satisfied with how it generally turned out. I think the sandwich making portion of the game works fairly well with the exception of the Sandwich Checking algorithm still being very finicky and easy to exploit. I managed to get my entire model in the game and have it lit so the environment is present as I originally wanted. Additionally I learned a some new things in Unity with setting up and managing 3D animations and using a NavMesh to control the customer's movement. If I had more time I would add some simple mechanics that forced the user to navigate the store and parking lot. I had intended to have different tasks that the user would have to do like -- get more supplies from the freezer, mop the floor, take out the trash, etc. Additionally I would finish the model. Right now I have the general store and gas station modeled but I would want to fill it with product. I would fix the Sandwich Checking algorithm but as it would have required a pretty large change to how it worked, I did not want to start to change it and have a lot of other things break as a result. Additionally I would do a bit more work on optimizing graphics for WebGL so it looked better.